In this video, internationally acclaimed teacher, author and chant master Jonathan Goldman takes us on a captivating tour of the world of Sound Healing. Through teachings, meditations, healings and visual imagery, he shows us how to use the innate power of sound to heal our bodies, clear our minds, and renew our spirits. From the ancient knowledge of the past, to the advanced science of today, Goldman reveals a magical world that is created, healed and transformed by the power of sound. In this insightful and informative presentation, he introduces us to some of the basic concepts in the use of sound as a therapeutic and healing modality. Included in this lecture are topics such as: the vibratory nature of our world, brainwave activity, bio-resonant frequency, sonic entrainment, the magic of Cymatics, the effects of sound on the immune s ystem and the power of right intention in the healing process. 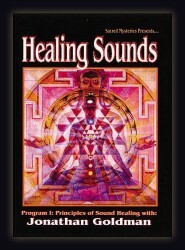 During the course of this video, Goldman discusses and demonstrates the use of the voice as a potent instrument for the restoration and maintenance of optimal health, how the power of music can assist us in leading more vital, energetic and well-balanced lives and how we can use simple techniques of sound healing to bring more luminosity into our bodies and energy fields. In addition, through the use of visual images, he shows us how sound vibrations can change molecular structure, as well as how sonic frequency coupled with intent equals healing. Also included are excerpts from Jonathan Goldman's many rich and meditative albums. "What is sound? Sound travels as a wave. Each sound has a frequency or rate of vibration; A low sound vibrates slower; a high pitched sound vibrates faster. When sound reaches the human ear, resonance takes place. Musician and sound healer Jonathan Goldman thoroughly explains the scientific aspects of how each object of matter, including stars, planets, human bodies, and plants, vibrates at it's own rate, giving off a sound that emanates out into space, in this fascinating and inspiring presentation. When Goldman engaged in a scientific research project involving sound waves, he realized the human body is like an orchestra where the sound of each organ and each function combines to create the music of the body. When one aspect of the body gets ill or out of balance, the whole orchestra may give off disharmonic waves, causing disease. By applying sound therapy, the body may be brought back into balance and healthy vibrations. 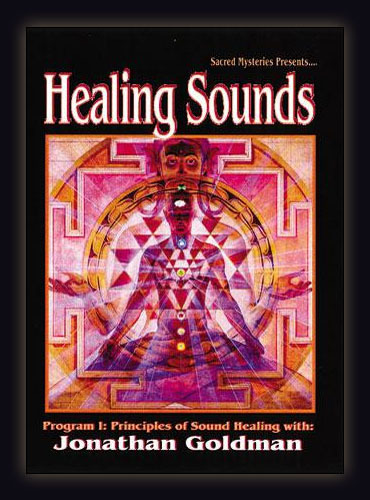 "Healing Sounds is a fascinating account of Goldman's scientific and spiritual studies. Goldman plans to produce a Program 2 DVD in the future. Display this with Goldman's CD Chakra Chants." "Healing Sounds is a great gift for humankind. It is of benefit now and for the future."